The language is blunt, but the point is clear. After four years of war, the western-backed Saudi coalition has not dislodged the Houthis from the capital Sanaa or the strategic port of Hodeidah. In what Blumi sees as a war of plunder for a system of financial capitalism on the brink of collapse, defeat in Yemen will be potentially fatal, most of all for the Saudi regime in Riyadh. Yemen may be physically destroyed and its people starving, but the Saudi state could go the way of the Soviet Union, into the annals of history. Blumi, a lecturer in Turkish studies at Stockholm University, wants to upend the western and Arabic media narrative of the Yemen war. Instead of the “internationally recognised government of Abd Rabbuh Mansour Hadi” fighting “Iran-backed Houthi rebels” (AFP's favoured framing), the author describes a war with origins a century old that has little or nothing to do with Iranian expansion or terrorism, and everything to do with eliminating resistance to the western-backed Arab Gulf states. Destroying Yemen is an honourable addition to the kind of radical anti-colonial political economy, exemplified by Egypt-born Marxist Samir Amin, that has challenged western historiography since the 1960s but has been less apparent in the post-2011 “Arab Spring” era. In part a polemic against financial “globalism”, this is no dry academic exercise, but rather a thoroughly researched, heartfelt intellectual missile to be lobbed over the wall of western analytical group think on the Middle East. Destroying Yemen is ambitious in its scope, as its subheading – What Chaos in Arabia Tells Us About the World - indicates. Its introductory chapter plunges us into global systems theory, which sees Yemen as one of the states that resisted western and Arab colonialism since the fall of the Ottoman Empire. Yemen and Yemenis have never been fully integrated into the global capitalist economy, Blumi argues, and this presents an ongoing challenge to “empire” that the latest western-backed war has attempted, but failed, to solve. Further, with a history as a trading people with a centuries-old mercantile network stretching across south-east Asia, and a skilled workforce that helped build Arabia and the British empire, Blumi sees Yemenis as the hidden glue in a global economy that has nevertheless marginalised and exploited them. Britain, which held the port of Aden since the 19th century, is the imperial power that for more than a century had sought to end Yemen’s independence and incorporate it fully into the imperial economy. From the first world war, when Britain imposed a naval blockade on Yemen’s Red Sea ports, it allied with the newly installed Ibn Saud dynasty against Yemen and continues to do so all the way until Mohammed bin Salman’s devastating war starting in 2015. North Yemen’s first ruler, Imam Yahya, was murdered in a 1948 coup, but the British backed “modernist” Abdallah al-Wazir, the new imam, failed to hold onto power and Yahya’s charismatic son Ahmad was soon installed. Ahmad secured aid from the communist bloc, which came with few strings, while resisting the crude bribery attempts of the United States’ emissaries (which, Blumi points out, had worked very well in Saudi Arabia) and whose racism was a major impediment to winning over Yemen’s proud rulers. The persistent misperception, fed by racism, of Yemen as a land of "primitive tribes" by British and American agents is a running theme in the book. 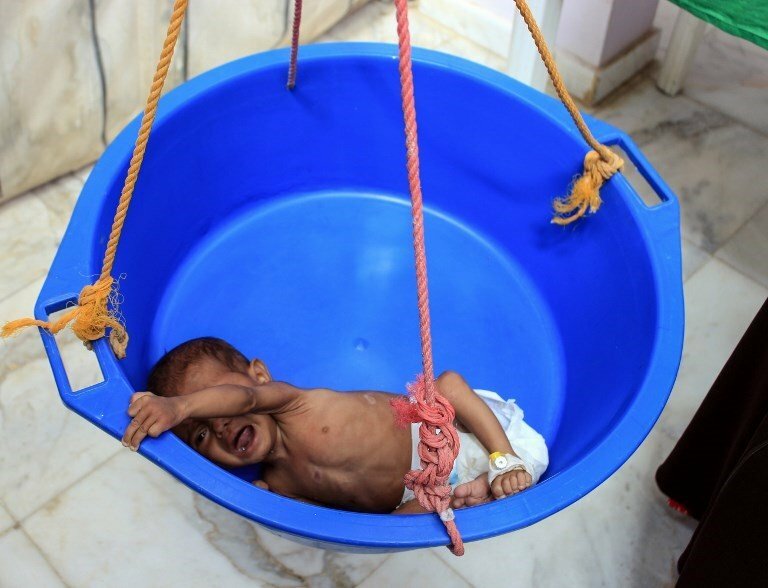 A Yemeni child suffering from severe malnutrition is weighed at a hospital in Yemen's northwestern Hajjah province, on 26 January 2019 (AFP). Blumi sees the rule of Imam Ahmad (1948-62) as part of an anti-colonial Islamism that stood in total opposition to the Wahabbi version of ultraconservative Islam that Saudi Arabia implanted across the Islamic world, as part of a western-backed cold war against communism. This, and circulating its oil profits through London and New York, formed the Gulf rulers' loyal service to empire. Ahmad was killed in a 1962 republican coup that ushered in an Egyptian occupation and war – sometimes described as President Gamal Abdel Nasser’s Vietnam - that lasted until 1970. With the Saudi oil boom providing huge remittances from Yemen’s expat Gulf workers, the 1970s were something of a golden age, until the seizure of power by a young army officer, Ali Abdullah Saleh, in 1978. Saleh was a wily operator who managed to plunder the country while also playing the Gulf states against one another, and signing deals with western oil companies to exploit Yemen’s great untapped oil wealth. In the 1980s, Hunt Oil, owned by a close friend of then US vice president George HW Bush, made a deal with the rulers of South Yemen to exploit vast fields in Ma’rib. This helped bring about Saleh’s greatest achievement: the reunification with Marxist-ruled South Yemen in 1990. Blumi is excellent in revealing clearly how the machinations to federalise Yemen and carve out the exploitable oil-rich regions, along with policies to sell off the South Yemen state’s assets, led rapidly to disillusionment with unification. This later gave birth to the Hirak independence movement in Aden. The uprising of 2011 in Yemen was a natural reaction to attempts to plunder Yemen’s economy by its long-time ruler Saleh in cohort with Saudis, Qatar and western powers. “A proud, dynamic epicentre of human ingenuity” was reduced through neoliberal development strategies and exploitative tourism in the 2000s “to a bordello for the Middle East by its corrupted political elites,” rails Blumi. In the recent era, Gulf states had provided the logistical support for militant groups including al-Qaeda in the Arabian Peninsula, Ansar al-Sharia and the Islamic State, none of which have roots in the Sufi oriented Islam of Yemen, argues the author. These, along with Sudanese mercenaries, became the foot soldiers in the current war against the Houthis. For Blumi, the twisting of the nomenclature of this conflict into a regional and sectarian narrative is a deliberate act of distraction and deception by outside powers trying to destroy the country for their own ends. Blumi is damning of the western-backed NGOs and new much-lauded faces of democratic change that were championed by global and Arab media in the protests of 2011. He sees this process of hand-picking cosmetic change leaders as a deliberate strategy that, as in Egypt and Tunisia, would see the revolution sidelined in a pseudo-democratic, Islamist-backed dead-end. (Instead, he strikingly positions Ansarallah militants as unlikely icons of anti-globalist millennial hipsters, if only they were not so systematically ignored by western media). Hadi, it must be remembered, was hand-picked by the Saudis and the West to replace the discredited Saleh in 2011. The second stage of this process was, as in Egypt and Tunisia, to find an acceptable coalition, led by Hadi and allies from the Islah (Muslim Brotherhood) party, to push through harsh neoliberal reforms, selling off the remaining assets of the Yemeni state before anyone could protest and resist. Since they were the most effective armed force, from the same region as the Zaidi imams who ruled north Yemen until the 1960s, the Ansar Allah movement was well suited to take forward the revolution that began in 2011 but that had been derailed by the Saudis, the United Arab Emirates and Qataris, backed by the UN and the West. Which brings us to today, with the war in stalemate and the country in ruins, perhaps 150,000 dead, more than half of them children who have died from hunger and disease, mostly forgotten by the outside world. Nasser’s war in Yemen helped finish him. The same fate is destined for MBS’s war in Yemen, predicts Blumi, as the "KSA's gamble to subdue Yemen quickly as far back as the 1930s has ultimately caught up with it." He adds, in reference to the Gulf feud between the Saudi bloc and Qatar: "All the major players in this race to destroy Yemen have miscalculated the relative ease in securing this region's vast natural resources. All of the big players are in the throes of a violent war from within." The first rule of Arab Fight Club is – well you know the rest.